While Casa Fernández has manufactured several of Warped's lines in the past, the Futuro is the first true collaboration between the two companies. In this prestigious blend, Kyle Gellis, the owner of Warped, and Max Fernández opened up Casa Fernández's Vault which houses revered tobaccos from the Fernández Aganorsa farms. A Nicaraguan puro, the Futuro features Criollo '98 and Corojo '99 fillers which are also used for the binder and wrapper, respectively. Defined by notes of cream, coffee, and subtle spice, Warped's Futuro offers a medium to full-bodied smoke and is presented here in the Selección Suprema vitola. 5% Off Five Sticks: $8.46 ea. 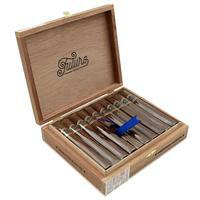 10% off box (20): $8.01 ea.